It’s time for a deep dive into the 2018 Kaiser Family Foundation Employer Health Benefits Survey, which you can read online for free. The survey provides valuable national benchmarking for employer-sponsored health coverage in 2018. If you’d rather not to wade through the entire report, please enjoy my highlights on prescription coverage below. 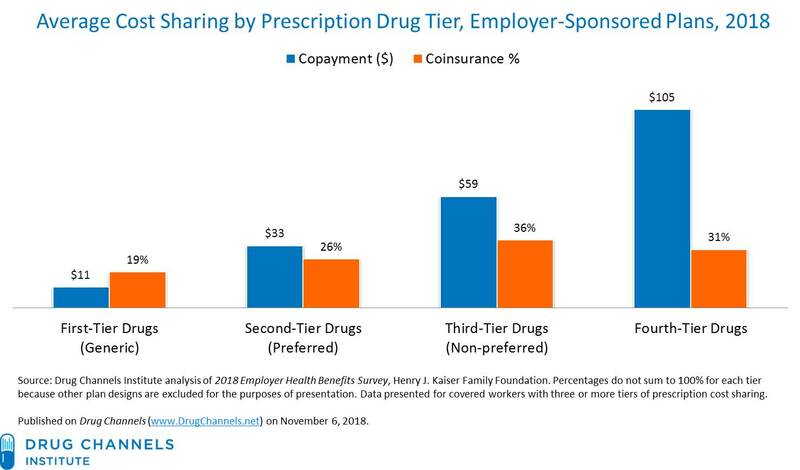 I summarize employers’ 2018 pharmacy benefits by examining (1) cost sharing tier structures, (2) prevalence of copayment vs. coinsurance, and (3) average copayments and coinsurance rates, by formulary tier. I breakdown the 2018 results for plans with and without high deductibles. For 2018, employers continue to increase cost-shifting for specialty drugs. Most plans have four or more tiers. Economically debilitating coinsurance—in some cases with no limit on out-of-pocket expenses—remains distressingly common. Many people with employer-sponsored insurance are being exposed to prescription list prices, regardless of the actual net, post-rebate costs. 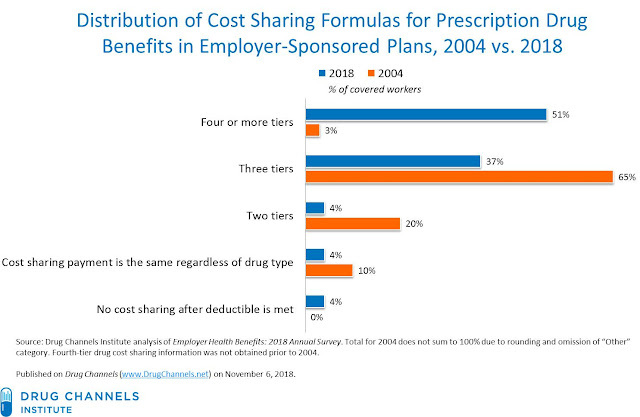 In a follow-up article, I’ll provide thoughts on what employers’ benefit designs mean for patient affordability, out-of-pocket costs, and perceptions of prescriptions prices. Spoiler: Patients won’t be looking like they are having fun. The Kaiser Family Foundation conducts an annual survey of employer-sponsored health benefits. The 2018 report tracks health benefits at 2,160 firms. More than 70% of the responding firms participated in either the 2016 or 2017 surveys, or both. Click here for the full methodology. Employers are one of the largest payers of prescription drugs. Nearly all large employers and more than half of all small employers offer health benefits to employees. Nearly all (more than 99%) covered workers in these plans have a prescription drug benefit. 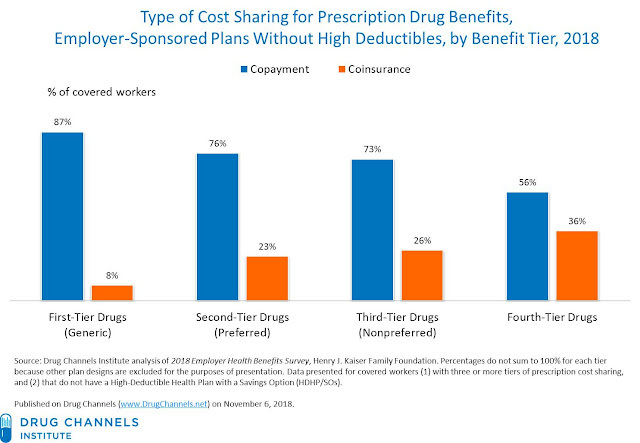 For consumers with third-party pharmacy benefit insurance, their share of a prescription’s cost is usually linked to benefit cost tiers—categories that define a plan member’s copayment or coinsurance. In general, prescription drug plans financially reward patients for using generic and lower-tier drugs. They require the patient to pay progressively higher copayments or coinsurance for drugs on higher tiers. Allowing the beneficiary to pay less out of pocket for generic drugs, for example, supports the substitution of therapeutically equivalent generic drugs for brand-name drugs. For more background on pharmacy benefits and comparisons between payers, see Chapters 5 and 6 of our 2018 Economic Report on U.S. Pharmacies and Pharmacy Benefit Managers. Generic drugs: Drugs that are no longer covered by patent protection and thus may be produced and/or distributed by multiple drug companies. Nonpreferred drugs: Drugs not included on a formulary or preferred drug list; for example, a brand-name drug with a generic substitute. 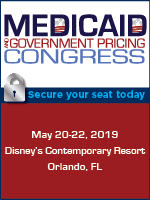 Fourth-tier drugs: New types of cost sharing arrangements that typically build additional layers of higher copayments or coinsurance for specifically identified types of drugs, such as lifestyle drugs or biologics. Specialty drugs: Specialty drugs such as biological drugs are high cost drugs that may be used to treat chronic conditions such as blood disorder, arthritis or cancer. Often times they require special handling and may be administered through injection or infusion. Note that I reproduced the definitions exactly as they appear in the report. In 2018, plans with four or more tiers remain the most common option, used in 51% of employer-sponsored plans. (See chart below.) In 2004, only 3% of covered employees were in plans with four or more tiers. Plans with four or more tiers have grown at the expense of three-tier plans. Last year, 44% of employees were in plans with four or more tiers, while 40% were in three-tier plans. 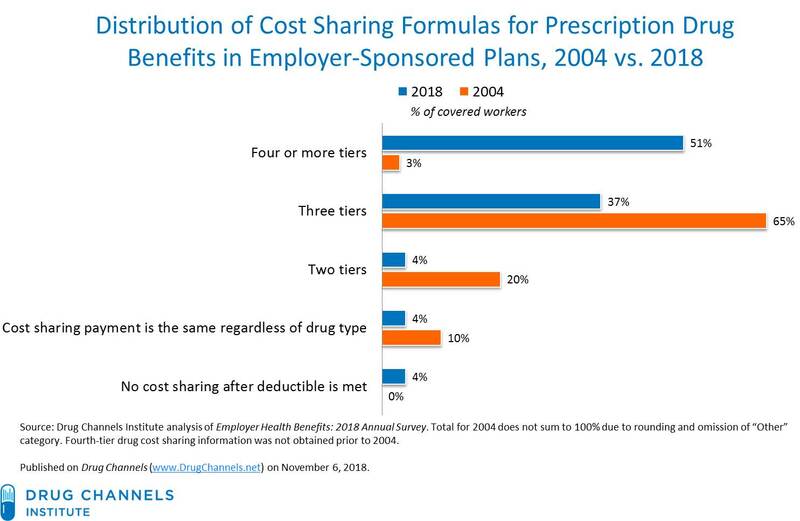 In the employer data shown above, a small percentage of plans (4%) have the same cost sharing regardless of drug type (excluding specialty drugs). Among these workers, 8% have copayments and 92% have coinsurance. The average coinsurance rate is 20%. In addition to an increase in the number of tiers, enrollment in High-Deductible Health Plans with a Savings Option (HDHP/SOs) is growing. The Kaiser survey defines HDHP/SOs to be plans that have a deductible of at least $1,000 for single coverage and $2,000 for family coverage and that also offer either a Health Reimbursement Arrangement (HRA) or a Health Savings Account (HSA). The chart below shows how enrollment in HDHP/SOs has increased, from 4% of workers in 2006 to 29% in 2018. For 2018, there was no difference in the utilization of HDHP/SOs between large vs. small companies. Note that prescriptions are usually excluded from these general annual deductibles in employer plans. 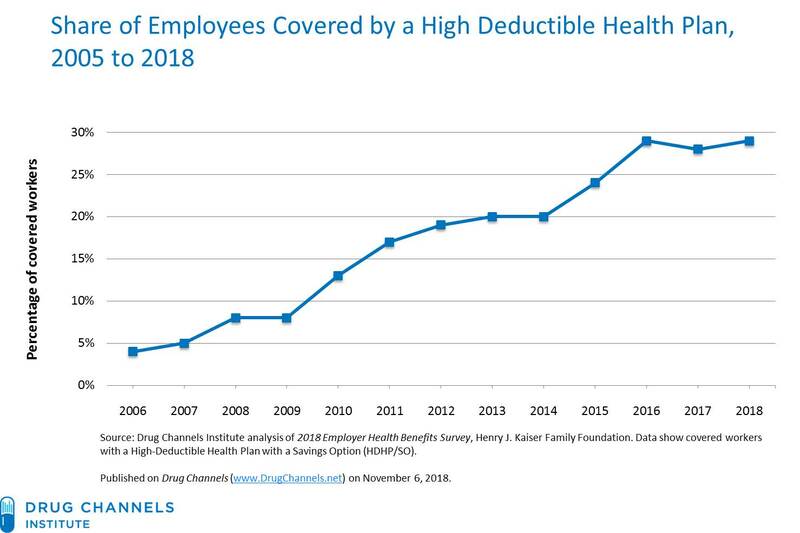 For 2018, 83% of workers had coverage for prescription drugs without having to first meet the annual deductible. There has been little growth in the past few years. Employers may be less willing to shift more costs onto their employees. There is also growing evidence that HDHPs deter people from seeking necessary and appropriate healthcare services. 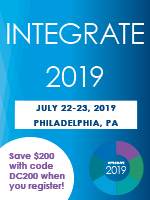 A booming economy and greater competition for workers could even reverse the trend toward high-deductible plans..
preferred provider organizations (PPOs), and point-of-service (POS) plans. Note that our presentation below differs from our analysis in previous years. This year, we present the plan types separately. The chart below shows the utilization of copayment vs. coinsurance in employer-sponsored plans without a high deductible. These plans favor copayments over coinsurance, though coinsurance is more common on higher formulary tiers. 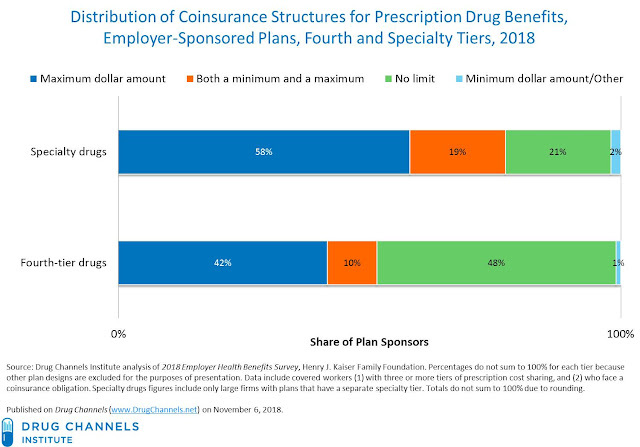 About one-quarter of covered workers in these employer-sponsored plans face coinsurance for drugs on the second and third tiers, and more than one-third have coinsurance for fourth-tier drugs. By contrast, HDHP/SOs favor coinsurance. 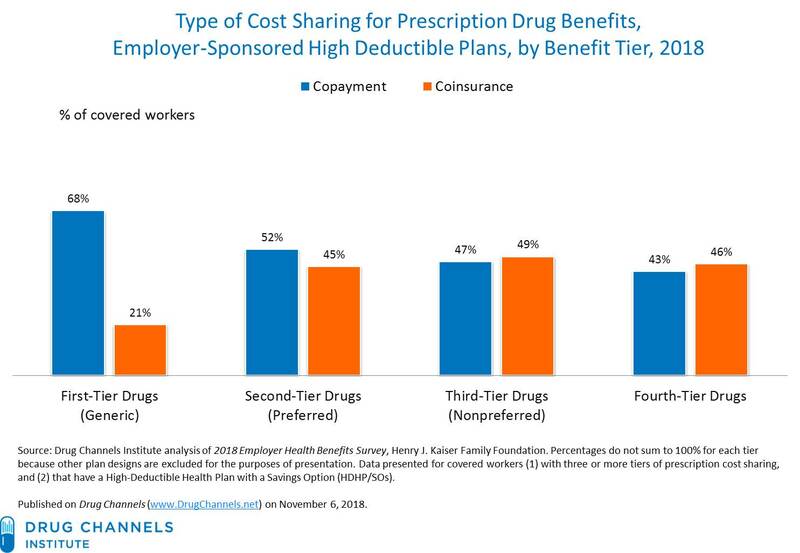 For second- and third-tier drugs, the share of employees with coinsurance is almost double in HDHP/SOs compared that of more traditional plans. For fourth-tier drugs, 46% of employees in HDHP/SOs face coinsurance vs. 36% in other plans. The chart below shows average copayments and coinsurance rates for employer-sponsored prescription drug plans with three or more cost sharing tiers. (The data are not available for HDHP/SOs vs. other plans.) The copayment levels and coinsurance rates are similar to the figures for the 2017 benefit year. The 2018 survey also asked employers about separate specialty drug tiers at large firms. 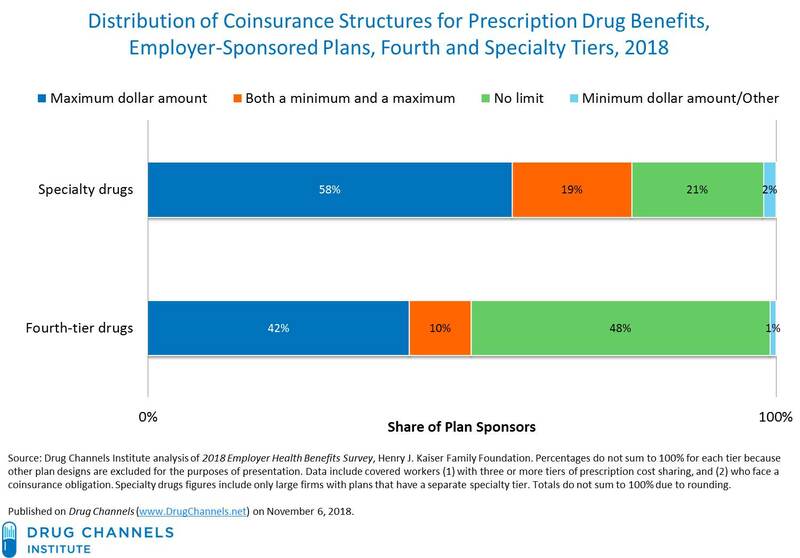 In 2018, 52% of covered workers are enrolled in a plan that has a separate tier for specialty drugs. In 2016 (the first year that this information was reported), 43% of workers faced a separate specialty tier. In plans with a specialty drug tier, 59% use coinsurance on that tier. Coinsurance rates for fourth-tier drugs average 26%. The chart below examines the distribution of coinsurance structures for the drugs on the fourth and specialty tiers. Some workers are in plans that limit out-of-pocket maximum dollar coinsurance payments. 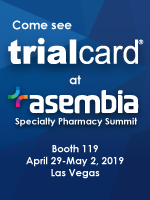 However, almost half of all workers have no out-of-pocket maximum for fourth-tier specialty drugs, and one in five has no limit for fourth-tier drugs. Just ‘cause I tell a joke or two, it doesn’t mean that all of this cost-shifting is good for patients. More to come. We lost Aretha Franklin this year. 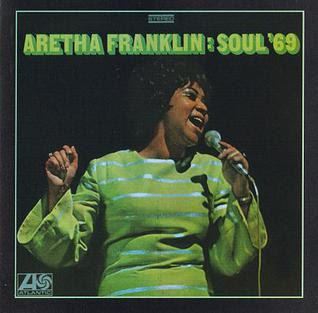 Listen to the Queen of Soul explain pharmacy benefit design. Click here if you can’t see the video.